This new delivery joint in Gurgaon is doing delicious sandwiches and paninis and the best part is amount them is they deliver late over the weekend. 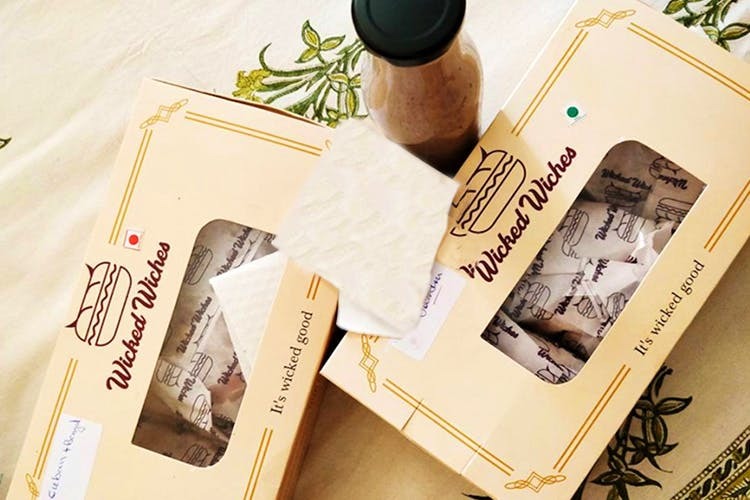 Wicked Wiches in Gurgaon is a delivery joint that’s doling out fresh sliders, gourmet sandwiches and yummy paninis. For everyone who takes a dig at vegetarians (we’ve all been there), this place is doing incredible enough sandwiches to make you switch to green – like their juicy Ultimate Avocado, or if you like mushrooms, The Umbrella. They have some really nice cottage cheese sliders and a roasted broccoli panini that is loaded with green goodness. Carnivores, don’t despair – they take their meat pretty seriously. You can gorge on the Mehico (it’s got grilled chicken and bacon), or The Cuban, filled with pulled pork and smoked ham. Try the Desi Party Panini, with pulled chicken, and their finger-licking BBQ pulled pork sliders. We hear their 4Cs cold coffee is a real winner, so we recommend you order that with your meal. They’re winning for their use of organic vegetables and milk, and fresh, fluffy bread. They deliver till 2 am over the weekend, so you know just who to call after that sesh of Saturday night drinking with the gang. Otherwise, it’s a great option for days when you’re stuck in office and craving something quick and tasty to eat. Fresh bread, good sauces and late night delivery. There’s just something about a well-made sandwich that makes it our go-to comfort food, and the people at Wicked Wiches have managed to perfect that.